WEST GROVE – Landenberg artist Karen O’Lone-Hahn has created many paintings as well as pottery, books, and other items in her own folk-art style. From nostalgic black-and-white portraits to whimsical cows and cats in colorful acrylics, O’Lone-Hahn’s works express a rich and talented imagination. 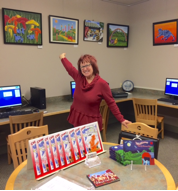 Now her art is on view at Avon Grove Library, where paintings and signed copies of her books are available for sale through March. The library will host a reception for O’Lone-Hahn on Saturday, January 28, 4-6 p.m. All are invited to meet the artist, discuss her works, and enjoy free refreshments. No registration is necessary.